Trumps Exult Following Reports Of No Phone Contact Ahead Of 2016 Russia Meeting Donald Trump Jr. did not call his father from his cellphone as he was arranging a Trump Tower meeting to get dirt on Hillary Clinton, according to new reports. 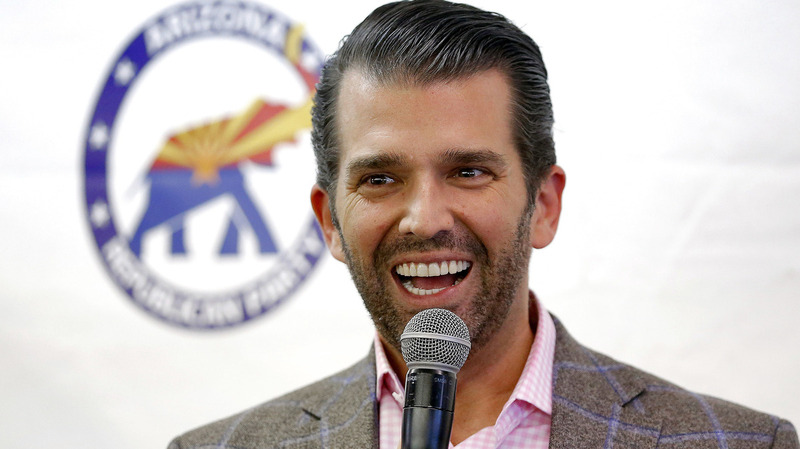 Donald Trump Jr. spoke at a campaign rally for Sen. Martha McSally in 2018. He and President Trump welcomed reports Thursday that they didn't talk on the phone ahead of a June 2016 Trump Tower meeting with Russians. Democrats and others have focused on calls that Trump Jr. made to a blocked number at the time he was arranging the meeting. Trump Jr. told members of Congress he didn't remember whom he called. The elder Trump used a blocked number. If investigators could establish that Trump Jr.'s calls had been to his father, that might suggest they'd discussed the meeting and that Trump therefore knew about Russia's offer of help to his campaign, the theory ran. But CNN, then ABC and The New York Times, reported on Thursday that Senate investigators have established Trump Jr. did not call his father. Trump Sr. appeared to confirm as much in a tweet on Thursday night. Members of Congress so far have not confirmed precisely what information has been gathered. The chairman and vice chairman of the Senate intelligence committee have not commented on the press reports. Trump has said he was not aware about Russia's outreach to his campaign in 2016 nor of the "active measures" it was waging against the West; he goes back and forth about what he acknowledges about Russia's interference in the 2016 presidential election where he emerged victorious. House intelligence committee Chairman Adam Schiff, D-Calif. — who told NPR that the Trump Jr. phone records were going to be a focus of his investigation this year — said he couldn't confirm the reporting and that whatever Senate investigators have learned, it isn't conclusive. "Those conversations could have taken place over the phone or they could have taken place by Don Jr. walking down the hall to talk to Dad," Schiff said. "But it's key to understanding the president's involvement in all of this, and if we look at what we already know ... the president and his son misled the country about meetings the campaign was having with Russians." Schiff's comment referred to the evolving explanations given by the president and Trump Jr. about the 2016 meeting, which they initially said was largely about "adoption," and since have acknowledged was to seek out compromising material to use against Clinton. Others, including former Trump campaign boss Steve Bannon, have theorized that Trump Jr. might have talked with Trump about the meeting in person or even introduced the Trump Tower guests but the facts of what took place are still unclear. According to accounts given by people who participated in the meeting, what the Russian delegation actually gave Trump Jr. and his colleagues was a tip about Democratic investors who might have been moving money improperly out of Russia. Trump Jr. said nothing came of the meeting and he didn't pursue the lead given by attorney Natalia Veselnitskaya. Trump Jr. and the president deny they or the campaign had any involvement with Russia's interference in 2016, which is the subject of an ongoing investigation by Justice Department special counsel Robert Mueller. Trump Jr. welcomed what he called the death of another false narrative about him. Trump Jr. also took aim at Schiff, who talked up the phone records question as he took over the chairmanship of the House intelligence committee and vowed to re-energize its Russia investigation. The panel, under then-Chairman Devin Nunes, R-Calif., concluded last year that there had been no collusion between the Trump campaign and the Russian interference and that contacts between people in the Trump camp and Russians were, at worst, "ill-advised." Trump has argued that convening a meeting to get dirt on an opponent is a standard play in politics and that no one did anything wrong. Schiff and others have pointed to the revolving explanations about the meeting and questioned whether Trump Jr. may have broken campaign finance law by soliciting help from a foreigner. There are also a number of unresolved questions about the wider Russia investigation, including about the Trump campaign's contact, via intermediaries, with WikiLeaks, and meetings that its former campaign chairman had with a business associate who's been linked to Russia's military intelligence agency.